The theme of the day on Friday was clearing snow. 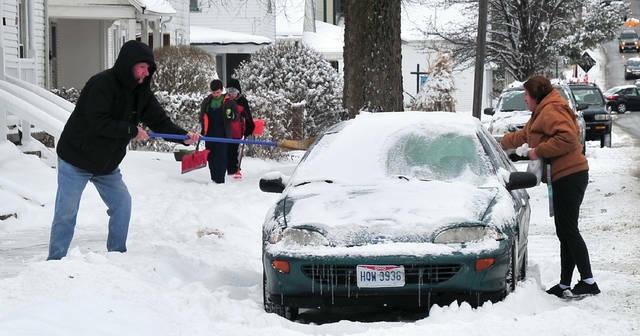 A pair of Park Avenue residents brush snow from a vehicle while two boys carrying shovels make their way down the sidewalk searching for snow shoveling work. 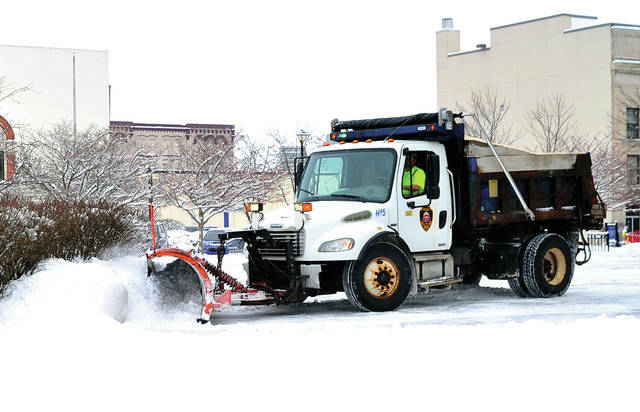 A city of Piqua plow truck clears the downtown parking areas on Friday morning. 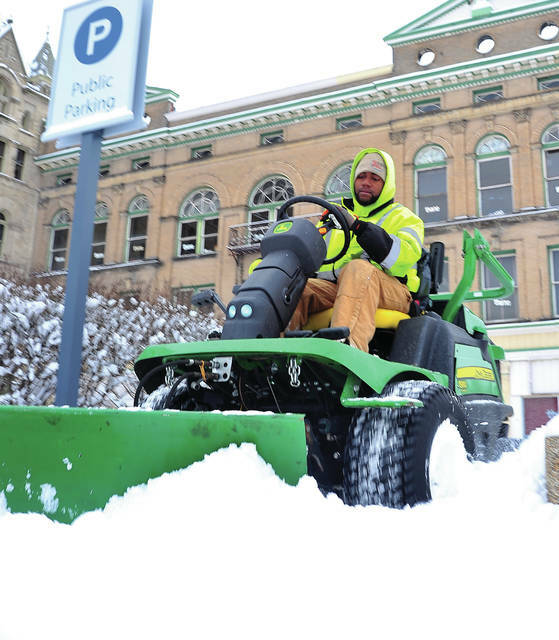 Smaller snow removal equipment worked on downtown sidewalks on Friday. 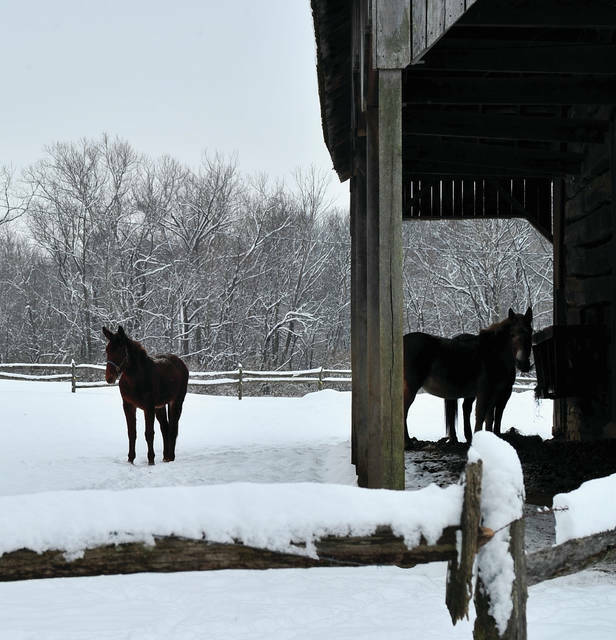 Two of the mules at the John Johnston Farm & Indian Agency ventured our of the barn to check out the latest snowfall on Friday morning. 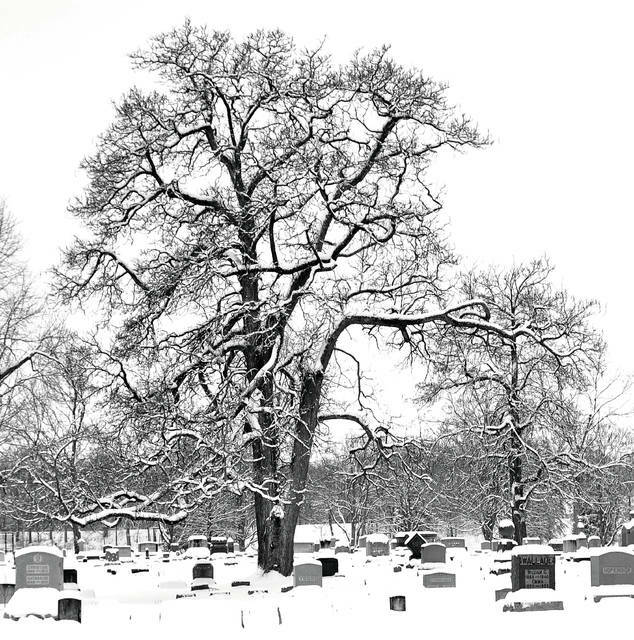 A large tree at Forest Hill Cemetery is accented by the recent snowfall. 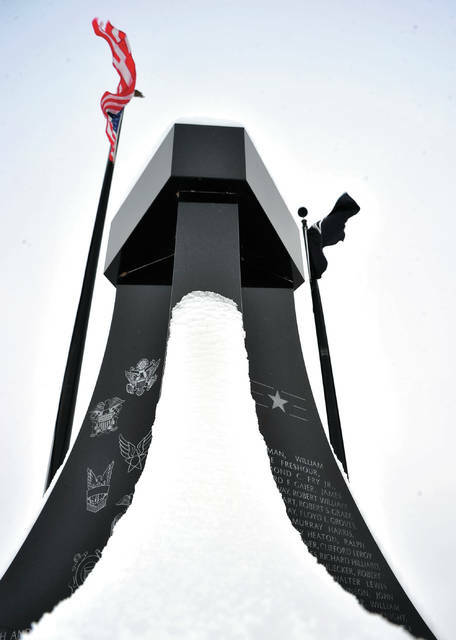 Snow clings to the Piqua Veterans Memorial following an overnight snowfall as the U.S. and POW/MIA flags stretch out in a stiff morning breeze. Cody Willoughby | Troy Daily News Stephenie and Stephen Hilton, of Troy, enjoy some sledding on the levee of the Great Miami River in Troy. Cody Willoughby | Troy Daily News A plow from Getter’s Automotive clears the parking lot of Katterhenry Investment Group on Friday in Troy. 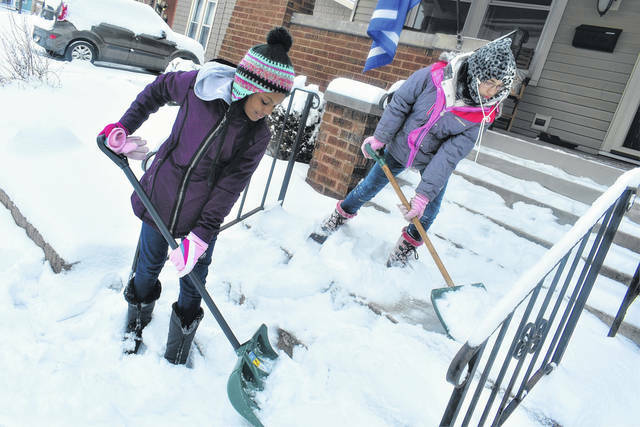 Cody Willoughby | Troy Daily News From left, Sophia, 8, Emma, 7, Grace, 11, and Olivia Davis, 4, of Troy cascade down the hill together during a snow day on Friday along the levee of the Great Miami River in Troy. 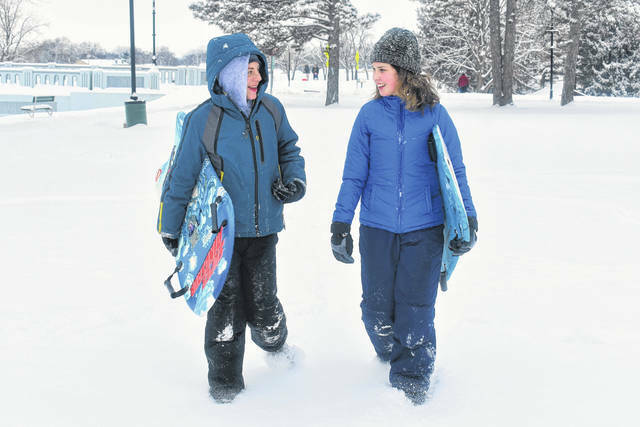 Cody Willoughby | Troy Daily News Bryson Croft, 13, and Lydia Witters, 15, of Troy head for a good sledding slope during a snow day on Friday on the levee of the Great Miami River in Troy. Cody Willoughby | Troy Daily News Nik Oda, of Troy, clears sidewalks after heavy snowfall on Friday. 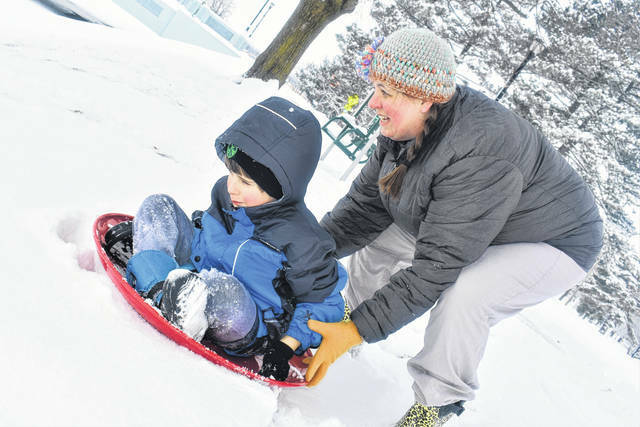 Stephenie and Stephen Hilton, of Troy, enjoy some sledding on the levee of the Great Miami River in Troy. 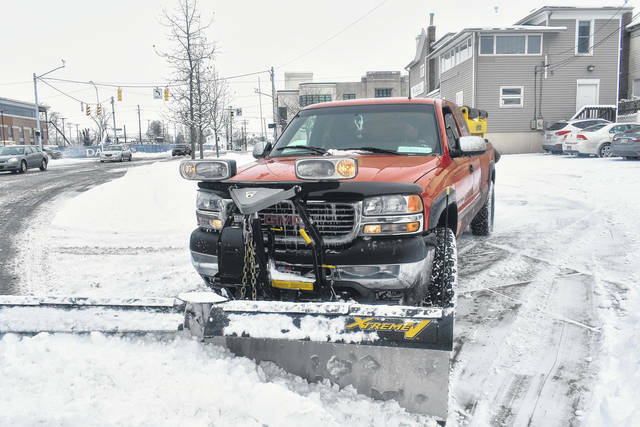 A plow from Getter’s Automotive clears the parking lot of Katterhenry Investment Group on Friday in Troy. 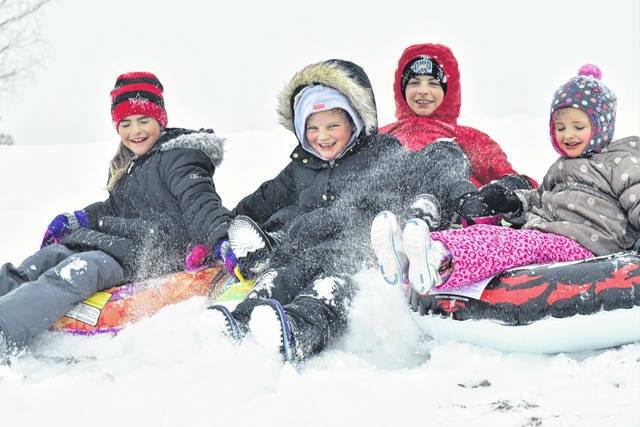 From left, Sophia, 8, Emma, 7, Grace, 11, and Olivia Davis, 4, of Troy cascade down the hill together during a snow day on Friday along the levee of the Great Miami River in Troy. Bryson Croft, 13, and Lydia Witters, 15, of Troy head for a good sledding slope during a snow day on Friday on the levee of the Great Miami River in Troy. 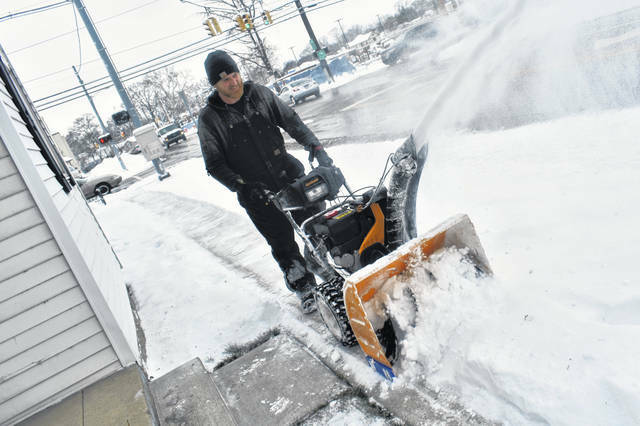 Nik Oda, of Troy, clears sidewalks after heavy snowfall on Friday.